Eisenhower’s words shocked many because they constituted his first public challenge to McCarthyism—an ethos enveloping the country at the time and fed by Senator Joseph McCarthy (R-Wis.), who inferred communist conspiracies everywhere in American culture, including books on the shelves of 194 information libraries that the US State Department operated in 61 foreign countries. 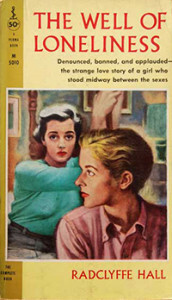 The Well of Loneliness, a 1928 lesbian novel by the British author Radclyffe Hall, was one of the books condemned by the National Organization for Decent Literature. Like-minded individuals also saw communist threats in the images on the covers of magazines, paperbacks, and comics that were stacked face-out on newsstand racks across the country. 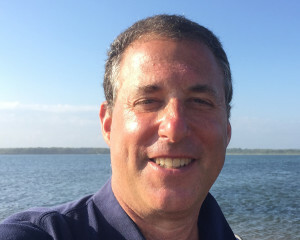 The US House of Representatives even set up a Select Committee on Current Pornographic Materials to investigate the publishers. Outside Washington, the National Organization for Decent Literature (NODL) sponsored by the Roman Catholic Church issued monthly lists of condemned titles that local parishioners used to police newsstands (and, on occasion, local public library shelves). Owners who passed muster received NODL seals of approval to display in their windows; sales at newsstands that did not display a seal invariably suffered. But Eisenhower’s words were very welcome to the American Library Association (ALA). In May 1953, ALA delegates met with members of the American Book Publishers Council (a parent organization of the Association of American Publishers) in Rye, New York. From that conference emerged The Freedom to Read Statement that begins with the phrase, “The freedom to read is essential to our democracy,” and included seven propositions, the first being, “It is in the public interest for publishers and librarians to make available the widest diversity of views and expressions, including those that are unorthodox, unpopular, or considered dangerous by the majority.” It was transmitted to ALA for consideration at its 1953 Annual Conference in Los Angeles, June 21–27. 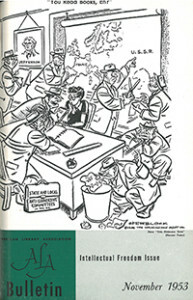 The November 1953 issue of the ALA Bulletin was devoted to intellectual freedom and reprinted a 1949 Herblock political cartoon on its cover. ALA had a number of important initiatives in the works at the time; all were threatened by the stance it would take on the Freedom to Read Statement. Its Committee on Intellectual Freedom (established in 1940) had just concluded a preconference at Whittier (Calif.) College on June 20–21, 1953, and passed its recommendation to prepare a “statement on book selection in defense of liberty in schools of a democracy” on to ALA.
At the same time, the ALA Federal Relations Committee (now the Committee on Legislation) was pressing the US Office of Education to enhance the status of its Service to Libraries Section and to increase funding for more outreach services that the Library of Congress and other federal libraries offered through libraries across the nation. 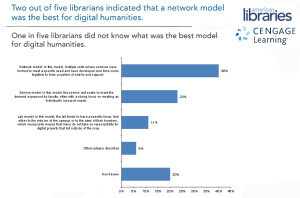 Most importantly, however, ALA was monitoring a Library Services Bill then before Congress to secure federal support for libraries. (It ultimately met success in the 1956 Library Services Act, the forerunner of the Library Services and Technology Act 40 years later.) All of these efforts were at risk, but ALA pushed forward anyway.